Growing up, Inuyasha had a difficult childhood. Being half human and half demon, he was ostracized from both worlds, never finding a place to fit in as a child. His father, a great dog demon lord, died when Inuyasha was born while his mother passed away early in his childhood. Although he has a half-brother, the full demon Sesshomaru, the two had a bad relationship due to Sesshomaru's distaste for Inuyasha's mixed heritage. The rest of his early life was lonesome and isolated until he met the priestess Kikyo. Although they should have been enemies, the two slowly fell in love until the tragic day that Naraku pitted them against one another. Believing Inuyasha had betrayed her, Kikyo sealed Inuyasha to a tree with a magical arrow. Kikyo died, and Inuyasha slept undisturbed for fifty years until Kagome arrived and set him free. Initially Inuyasha could not stand Kagome, due to her strong resembalance to Kikyo. 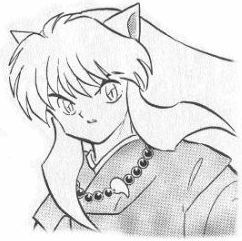 To counter this, the magical Beads of Subjugation were placed around Inuyasha neck, forcing him to the ground whenever Kagome shouts "Sit!" The pair slowly grow close as Inuyasha journeys to find the scattered pieces of the Shikon Jewel, but when Kikyo returns to life Inuyasha begins to doubt his feelings for Kagome. Due to his mixed parentage, Inuyasha also has to contend with an unusual affliction. Each month during the new moon Inuyasha looses his powers and turns into a human. This is when he is most vulnerable, and only his closest companions are aware of the time of his transformation. Another concern is when his demonic blood overtakes him, causing him to transform into a full demon. During this state Inuyasha is uncontrollable to such an extent that he attacks friend and foe alike. Over the course of Inuyasha's travels he learns that it was Naraku who engineered his feud with Kikyo. With his sword Tetsusaiga in hand, Inuyasha's mission has gone beyond merely collecting the jewel shards, but getting revenge against Naraku for his evil acts. 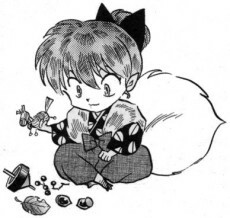 Initially Inuyasha wanted to use the completed Shikon Jewel to become a full-blooded demon, but he now has reservations for what that decision may bring. After falling through the well, Kagome finds herself in the Warring States Era of feudal Japan. Scared and alone, Kagome is attacked by demons who are seeking the Shikon Jewel inside her stomach. Kagome soon learns that she is the spitting image of a miko that once lived in a nearby village named Kikyo. This woman fell in love with Inuyasha, a half demon, before she was murdered by Naraku after believing she was betrayed by Inuyasha. It is Kagome that frees Inuyasha after finding him pinned to a tree with by an enchanted arrow. Kagome and Inuyasha's relationship gets off to a very rough start. Kagome reminds Inuyasha of Kikyo, the woman that cast the spell on him, and with whom he was in love. Later, much to Kagome's surprise, everyone learns that she is in fact the reincarnation of Kikyo. Throughout their adventures, the two become closer, but once Kikyo is resurrected by Urasue, their relationship falters while Inuyasha tries to sort out his feelings for Kikyo. Kagome is often frustrated by Inuyasha's fickleness, which has often caused a rift in their otherwise close relationship. Kagome is one of the only people that can check Inuyasha's ego when he gets carried away. Thanks to a magical rosary around his neck, Kagome is able to force him to the ground by shouting "sit!" Initially Kagome is rather helpless in combat, and it is her stray arrow that strikes the Shikon Jewel and causes it to shatter. However, she quickly improves her archery skills and becomes an important asset to the team on the battlefield. She is able to endow her arrows with an immense spiritual power that purifies demons out of existence, as well as clearing Naraku's poisonous miasma. 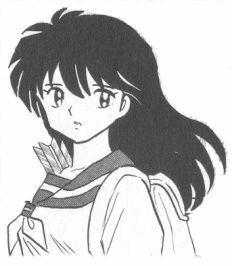 Kagome also makes use of her abilities to return to modern Tokyo, and brings back bandages and antiseptics to treat the wounds suffered by her friends in battle. Although Kagome's relationship with Inuyasha has its ups and downs, she remains very close with her other travelling compansions- particularly Sango. Kagome tries her best to encourage Sango and Miroku's budding romance, and shares in Sango's frustration over Miroku's wandering eye. Her interations with Kikyo, her rival for Inuyasha's affections is very strained. Kagome has tried to be civil towards her, but Kikyo's icy demeanor has ensured the two remain distant. Shippo is a fox also known as a kitsune. Legends of kitsune often portray them as a tricksters who are capable of using magic to disguise themselves. 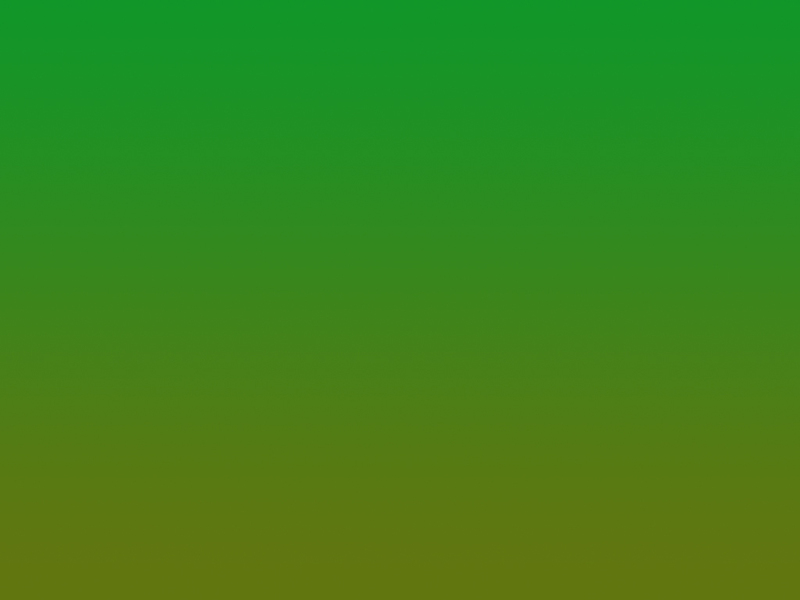 Shippo is no different as he has the ability to change his shape, which he uses to deceive and confuse. He has used this power to become everything from a bow to a skull. In the direst situations when Shippo has no choice but to stand his ground and fight he depends on his foxfire to attack opponents. Even though he comes across as a bit of a brat, Shippo is really a very kind person, and is at an age when he is experiencing the pangs of first love. With every village the group visits, Shippo explores and finds a cute girl to befriend, often falling in love with her much too fast. His kindhearted personality is especially evident when it comes to Kagome. He feels very protective of her because of all she did to help him after his father died. His fierce loyalty to Kagome ensures that he will always take her side in an argument with Inuyasha, especially when the topic is the half-demon's feelings for Kikyo. Even though Shippo and Inuyasha are constantly arguing or putting down one another deep down there is a grudging respect that exists between the pair and their relationship is best described as that of older and younger brothers. Shippo often feels it is his place to remind Inuyasha that he is not all-powerful and usually receives a punch to the head for his trouble. When his friends lives are in danger Shippo overcomes his nerves and finds the bravery that allowed him to confront his father's murderers.